Doylestown Music Fest is looking for sponsors to fund our free outdoor concert on Saturday May 4, 2019 from 11am – 6pm. 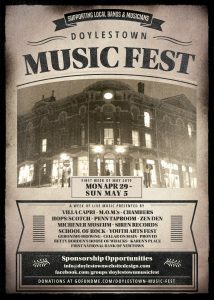 Doylestown Music Fest is a grass roots event that supports and promotes local bands and musicians. During this week-long event, local restaurants, bars, cafes, merchants, churches and museums host talented musicians for residents and visitors to enjoy. This year will be Doylestown Music Fest’s third annual event and we are looking to add a free outdoor concert in the heart of the borough featuring many talented musicians. We would also like to hire musicians to perform outside throughout town during that week. Our goal is to fill the streets of Doylestown with music. Participating venues include Villa Capri, Puck, M.O.M.S, Siren Records, James A. Michener Art Museum, The Zen Den, Chambers 19, Hops/Scotch 22, School of Rock, Doylestown Brewing Company, Penn Tap Room and others.